Which fruits and Vegetables are in season in Winter? Well winter is upon us once again, so it’s now time for slow cook roasts, warming soups, and hearty stews. I believe in buying what’s in season and what’s organic wherever possible. 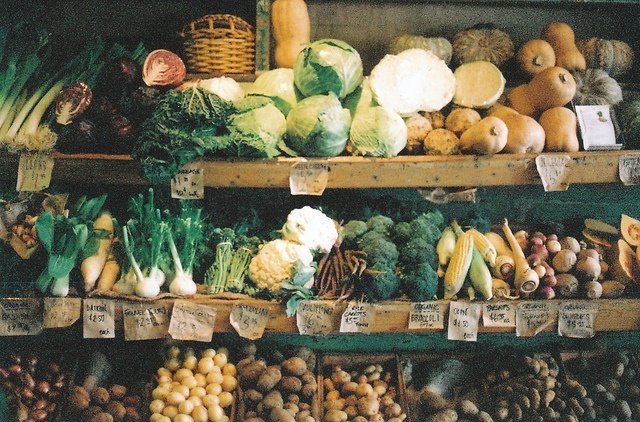 Buying seasonal produce is a great way to support your local farmers and farmer’s markets. In season, local fruit and vegetables are often more nutritious and tasty simply because there’s less chance they’ve been in cold storage for a long period of time which can affect these things. Also, having grown up helping on my Uncle’s farm in France, I find there’s something truly soul-satisfying about eating something that’s fresh from the earth! Winter vegetables are more varied than people think (check out the full list at the end of this post). My favourite winter crops for cooking are pumpkins, leeks and potatoes, which are perfect for soup making as well as classic roasting, cabbages, silverbeet, and fennel, which are beautiful braised, and your classic root vegetables like parsnips, turnips and carrots which are the perfect complements to any winter oven roast. Roasted carrot and pumpkin also make for a delicious winter salad when paired with feta, spinach or rocket leaves, some toasted pine nuts and lemon zest. Let’s not forget the winter fruits available on farmers market stalls! Lemons are common year round, but are often at their best in the colder months. They are perfect to add zest to everything from meat dishes and desserts to something as simple a glass of water. Another member of the citrus family is orange and one of my favourite winter salads is fresh orange segments and shaved raw fennel with just a splash of apple cider vinegar and olive oil to dress. Look out for seasonal, ripe fruits and veggies at your next local farmers market (or supermarket) and be sure to pick ones that are bright in colour, firm to touch and plump. To see my favourite winter harvests brought to life, check out my Winter Harvest Videos on my You Tube Channel. The first one features a classic French winter dish using the humble potato. en français pour ta mère et moi c’est pas possible?